I think at this point I can say I know something about this topic, right? First, let's start with the good stuff. 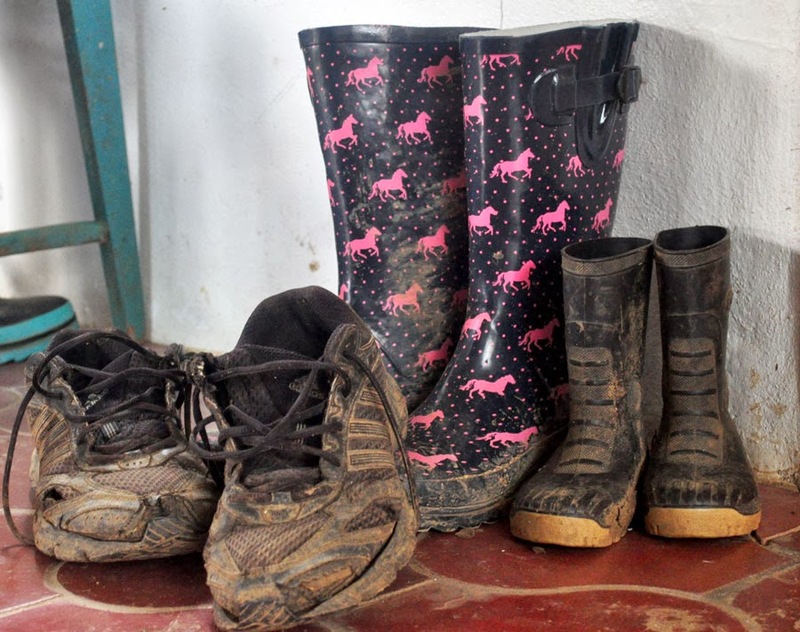 The most important thing to remember when you are hauling little kids around Belize is that, pretty much across the board, Belizeans love kids. When your toddler is fussing, rather then getting dirty looks from those around you, someone is more likely to hand your baby a cookie with a smile and an encouraging word. (This has actually happened to me several times). Don’t be surprised if grannies come up to you and ask if they can hold your baby for a bit. At the parish I have gone to for years, there are still kids that I am not quite sure who their parents are, because during Mass they are passed around from person to person, with everyone getting a chance to fuss over them a bit. That being said, it is also important to understand that Belize’s standards of hygiene and safety are very different then places like the states. For example, there is no law requiring car seat use, or even seat belt use in the back seats. Water and food-born parasites are extremely common here, so extra caution should be taken with young eaters. There are few conveniences like shopping carts or parking lots, and most of all, it is HOT. So how do I do it? Sheer determination to get out of the house, preplanning, and a method. First, car seats. I use them, but most other people don't, and like I said that is not against the law. Rental companies here mostly do rent car seats, but I wouldn’t count on it being a nice new model. 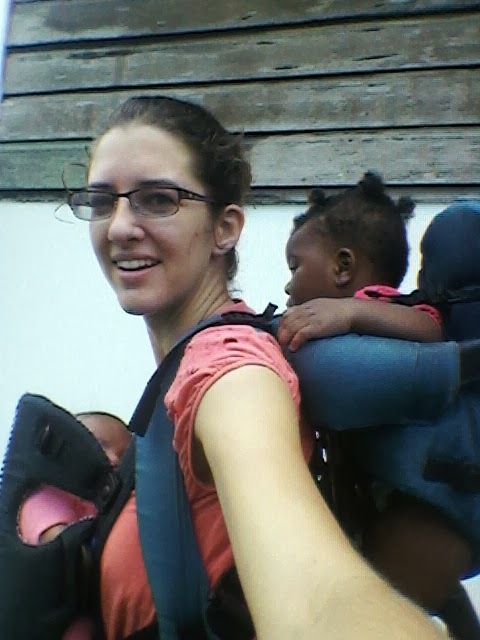 If you will be in Belize a while, it is worth it to buy a car seat. New car seats are extremely expensive and hard to find, but there are a few places that sell used car seats for between $50-70 Bz. The Boundary store in Orange walk usually has the biggest selection. If you plan on picking up a used seat, do your research before hand to know the best models and what parts should be included, because if there is a strap missing or it is a 3 point harness instead of 5, it is up to you to know that. I try to avoid situations in which I do not drive my own car or have a car seat, but sometimes it happens. If I have to ride in a taxi or bus or water taxi with no car seat, I strap a baby in my front carrier and then use the lap seatbelt for myself (if there is one). I figure it’s better then just holding her in my lap even though it’s far from ideal. When I have all the kiddos with me, I only go to the few grocery stores that have carts. Using a stroller inside isn't practical, cause the aisles are often narrow or filled with boxes. I also like to park in the new lot behind the welcome center in Cayo, which allows me to use a stroller because it has sidewalks straight to the market. However, there are a few places in Belize that are stroller friendly. Sidewalks are fairly rare-- even on part of Burns Ave, the center street in Cayo, there are no sidewalks so I have to push the stroller in the street while avoiding potholes. Not fun. Those big-wheel jogging strollers can come in handy over rough roads but are nearly impossible to find here. I also have a baby backpack with an attached leash for my toddler in case we need to walk along busy streets. As for supplies, diapers and wipes are easy to find anywhere. If your little one is potty training or newly potty trained, consider going back to diapers for a bit when you are out. Public toilets are few and far between here, and some of those are so disgusting that I would never take a child in. Always carry wipes, hand sanitizer, and toilet paper, because many restrooms will not have toilet paper or hand soap. You won't find changing tables anywhere, so bring a changing pad with you. If your baby is on a special formula, bring it because formula selection is limited to about 5 kinds, mostly nestle. Healthy snacks can also be a challenge. You won’t find prettily packaged toddler organic snacks here. When we are out and about, I stick to crackers, cheerios, and small boxes of raisins. I try and bring water with me for the kiddos, but all grocery stores sell bottled water if I forget. I think that is about it. When I bring people with me, they are always surprised at how exhausting it can be. Most of this is just due to the heat-- imagine moving babies from car seats to strollers to carriers and back when it is 90 degrees outside, then repeat 4 more times because there is no mega store where one stop has everything. And by the way, there is no AC anywhere. Bringing help is great, and being reasonable about how much time things will take and how much the kiddos can handle is essential. The Babe's social worker came to our house to give us the news that he would be going back to his family. We had a pretty good idea that it was coming; the social worker seemed enthusiastic about the Babe's family's efforts over the past few months, and had told us the judge would not consider his foster family at all in the court's decision. But still, we held on to a little bit of hope. When we heard the decision, I lost my breath and felt numb at the same time. So you can imagine we weren't really in the right state of mind for what she told us next. Social has been inundated with children this month. We need homes. Are you interested in a newborn? My husband and I are Catholic, and believe that marriages should be open to new life. Our situation has turned out a bit different from most families who have to consider adding another biological child to their family, but we try and follow the same guidelines. We have actually never "gone looking" for babies (besides signing up for fostering), but somehow babies keep coming. 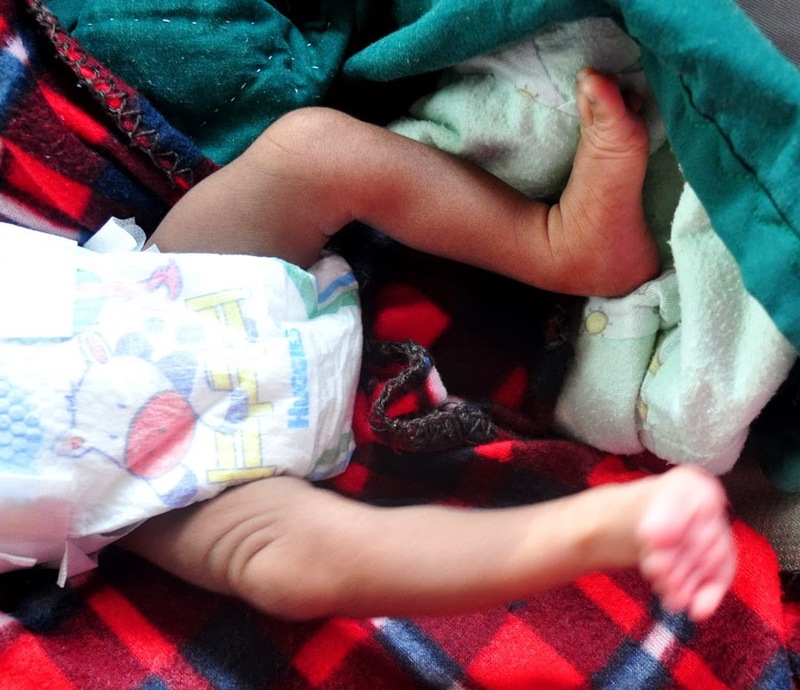 When we get a call that there is a baby that needs a home, our question is: do we have any grave reason not to accept this child? We need a little time to think about it, we said. To add to our emotions, in December we had been in the exact same situation. We got a phone call-- there is a baby due in a week and the people who were going to adopt have backed out. Would you be willing to adopt this baby? At that point we had a 2 1/2 year old and a 7 month old. I had a ticket to go to the States a week after the due date to take my boards. We took 2 days to decide: Yes. We will take him. 5 days later he was born. He was with us for 2 days, we gave him the perfect name and admired his 5 dimples and fattened him up. Then we got a call: his birth mother changed her mind. We had to give him back. 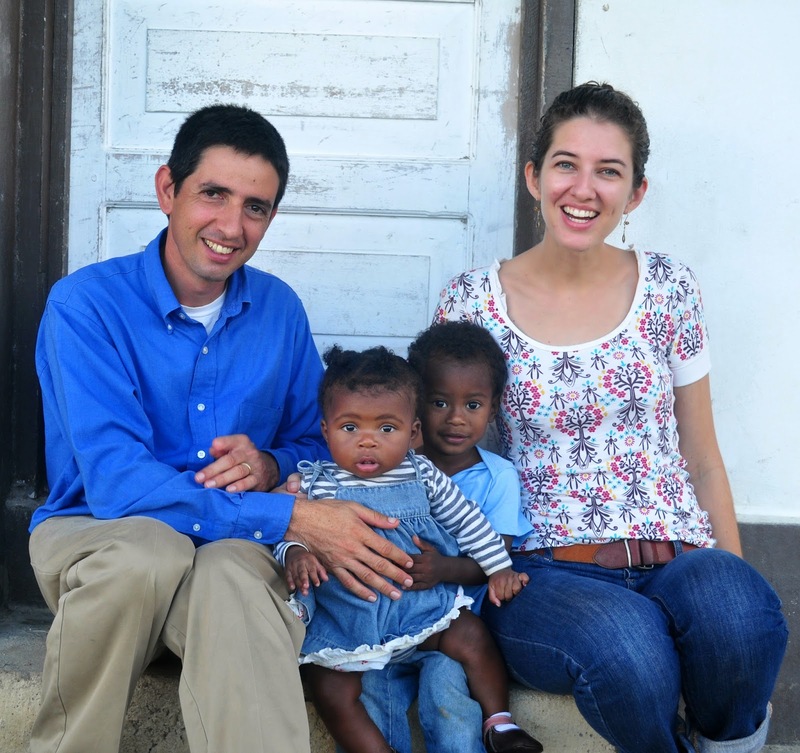 In Belize, the mom has 90 days after the child's birth to change her mind about adoption. In that time, the adoptive family can care for the child, but has no right to keep the baby if the mom decides she made the wrong decision. We knew this, but were still quite blindsided by her decision. No one had been given any indication that she was uncertain about her decision at any time. But we had no legal rights to him, so the day after we got the phone call we handed him back to his mom. So as you can imagine, we had a lot to think about when the social worker told us about the newborn. This new baby most likely would eventually be up for adoption, but there is always a chance it won't happen. We will be sad about our little Babes, and oh by the way we have an 8-month old and I babysit a 2 1/2 year old 5 days a week. So this is our life right now. It is crazy and I seriously question my sanity at least once a day, usually when everyone is crying at the same time. The pace is a lot different, more "I-need-more-hands" then "little-boy-with-SO-MUCH-ENERGY." Another challenge has been getting out of the house with three under three. The current solution is front pack, stroller, and leash, although sometimes I end up carrying the stroller occupant....while still wearing the baby in the carrier. I'm getting a good workout. Lu and Miss M are 7 1/2 months apart. Hopefully both of them will be with us forever. I can't wait till they are old enough to play together, I am so excited to have 2 little girls who are almost-twins. I hope this explains a bit also why we don't let friends know ahead of time our plans. It can be so uncertain, and it just makes it that much harder to have to send emails and explain that we don't have our baby any more... we are excited, and want to tell everyone, but we need to be sensible. With Lu our parents didn't even know till the evening after we got her! I can't imagine we will be adding more kiddos anytime soon, cause two babies and a toddler seem to be our limit.... give us a year or two to recover. So many things have happened in the last few months that getting stung by a scorpion, something that should rate an epic post based on my past history of talking about every critter I encounter, seems unimportant. I passed my boards in December (thank goodness, now I have another 10 years to forget everything I learned again). We also learned in December that our little Babes, who had been with us a year and a half, would probably be heading back to his family soon. Then early in January we got the call, and he headed to his new (old) home. Because of privacy concerns, I have never talked about being foster parents here on the blog. We probably won't be getting into another long-term fostering situation any time soon, so I feel like I can be a bit more open about things. And maybe I can be a source of information for others who are interested in learning more, because there really isn't a lot out there about Belize's system. Belize's foster system is probably a lot like every country's, in that it is government run and holy cow it can be super frustrating to try and work with the system. It's just a fact, and anyone who wants to get into fostering needs to know that up front, and have a really solid reason to become foster parents, because sometimes you will need to repeat that reason like a mantra to keep from poking your eyes out with a spoon in frustration. We decided to become foster parents as a sort of ministry, I guess you could say. I am trained in health care but am unable to work in Belize, and I wanted to find another area to serve. I've already worked with teenagers, and I felt like my husband and I could offer something to the littlest needy ones. So we signed up to foster children two and under (we figured we could squish a couple of tiny ones into our tiny house :) There is a process of interviews and paperwork to go through, and then they called and asked if we could take our Babes. We said yes. We saw him grow from a shy little baby, to a giggling crawler, to a tantrum-throwing 2-year-old, to a confident, crazy, athletic, and caring little boy. And then we had to let him go. 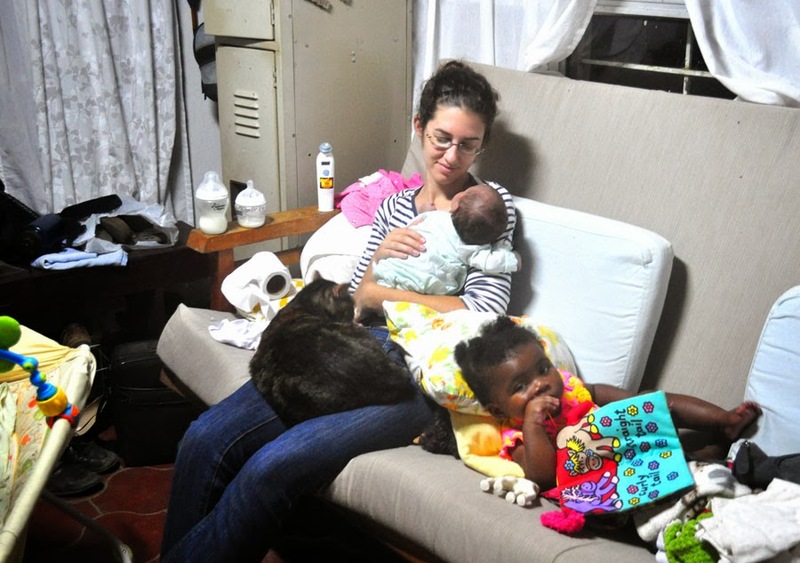 In Belize there aren't enough foster parents, so those kiddos who can't stay with their families are put in children's homes, which unfortunately tend to be overcrowded. I can't imagine the challenges of running a children's home, and I'm sure those in charge do their best. But I believe that if it is possible, a child should be with a family. That is what we think about when we are sad about our little guy. We gave him a family when he needed one. We accept the sadness as our price to pay for his comfort and safety and happiness. We are still foster parents, but we have chosen to move towards adoption and foster-to-adopt for the moment. Perhaps in a few more years we will go back to long term fostering.